The Oscar N. Jonas Foundation recently held its annual meeting. For 50 years, the Jonas Foundation has been “Bringing Art into Children’s Lives.”. This past year approximately 25,000 students from Dalton, Whitfield, and Murray County Schools attended Jonas art education programs. Also, Seretean Grants were presented to three elementary schools and the New Visions Fund provided artists for the CAG Festival. 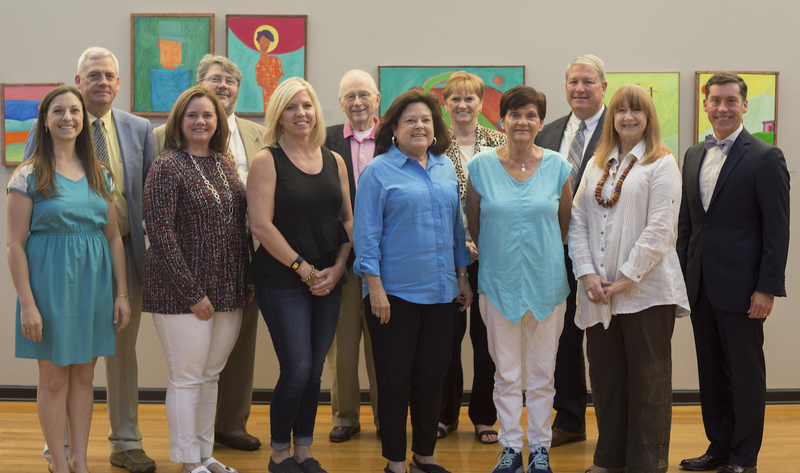 Jonas Board members present at the meeting were as pictured: Front Row, from left to right: Amanda Brown, Amy Cole, Kay-Lynne Kerr, Susan Reams, Sarah Jonas, Marcie Jonas Mann, and Rob Bradham. Back row, from left to right: Steve Loughridge, Gregg Bailey, Bill Weaver, Judy Gilreath, and Tim Scott. Renee Rector, Jonas Art Programs Coordinator for the CAG, presented the review of artists for last year and previewed the artist roster for the coming year. Also, representing the CAG were Lisa Elders (CAG) and Savannah Thomas (CAG). The following school residency coordinators reported on the art education programs for their schools: Lisa Hackney (DPS), Toby Westmoreland (MCS), Karen Williams (WCS), Richard Nelson (RYDC), April Bohannon (RYDC), and Jonathan Willard (Crossroads). Seretean presentations were given by Sally Creswell and Bethany Taylor (Varnell Elementary), Kay Dean (Park Creek Elementary), and Elizabeth Robison (Woodlawn Elementary).